Through wills, property inventories and other family papers, we found that John Ariss (notable Architect) and Samuel Walter Washington (a brother of George Washington) owned and shared Hatter slaves. Additionally, by 1830 emancipation records verify the enslavement of some of the Hatter’s in the wills of John Ariss and his wife Elizabeth. Reuben and James Hatter were brothers and slaves on Samuel Walter Washington’s plantation outside of Charles Town, Jefferson County, VA in 1801. Their mother was Charlotte, the mistresses’ lady in waiting for Elizabeth Ariss and who was freed along with her sister Sarah the housekeeper and their father Francis in 1802-3. According to the will and Deeds of Freedom from John Ariss files, they were to be granted their freedom only after the death of his wife. James Hatter, being fair in appearance and intelligent was raised up to be a houseman. James was allowed to marry and a number of children were born to James and Matilda, but sadly some of the children were sold to other plantations. Something happened for later we find James working and living near the Dickerson Furnace at Malden Salt Mines in Kanawha Valley. Samuel Walter Washington (brother of Geroge Washington) reluctantly sold Reuben Hatter to Christian Blackburn, who in turn emancipated him on the condition he leaves for Liberia along with his wife, Elizabeth. This picture is of the home of George and Nancy Hatter. Folklore has George refusing to continue living as a slave, so shortly after turning about 16 he escaped. The Sheriff caught him, and George was returned to receive a severe whipping and hard labor. Upon hearing that he and the others who had fallen in such disfavor of the plantation owner were to be sold off to the slave trader from New Orleans. George began to plot his next escape. Another version of this tale had George as a favorite of his mistress Mrs. Samuel Washington, and it was she who aided him in his flight. She provided a horse, provisions and instructions to hide by day travel by night and always follow the North Star. There was a large bounty out for young George. Thankfully, George did make it to Pennsylvania assisted by the Underground Railroad; Free Blacks and Quakers. There he married a beauty Mary Baker, from Liverpool, England. With her help in short order, he began to read and write. In studying hard, he excelled and became quite the orator speaking out against slavery. But it became apparent he was not safe, so they headed further north to Niagara area in Canada. In 1849, learning of the Elgin Settlement George and Mary prepared to move to Buxton. They finally arrived in 1850.The Hatter’s accumulated five hundred acres and had five children. George would become known as an outspoken abolitionist and many in the settlement sought his counsel for his opinion was highly respected. 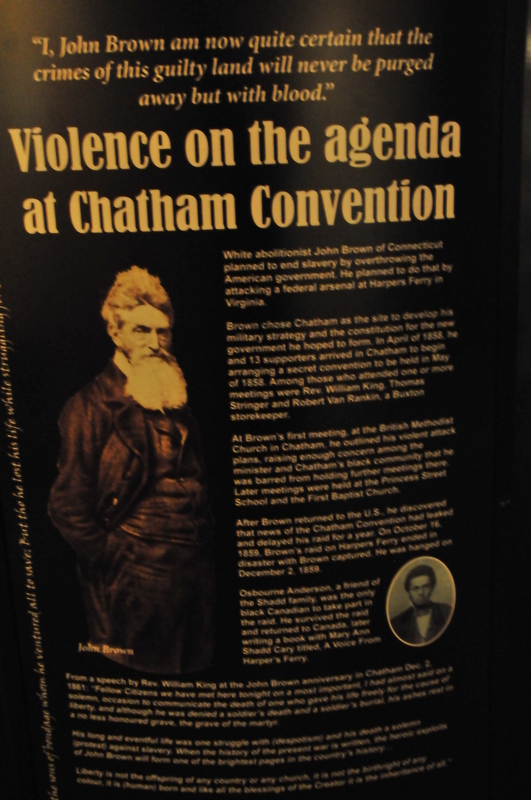 Notables such John Brown (Harper’s Ferry) would travel far to speak with him and others in Chatham-Kent on a number of occasions to discuss many issues concerning establishing a free state. George along with many other pillars of the Buxton Settlement declined to participate in the erratic schemes of John Brown. 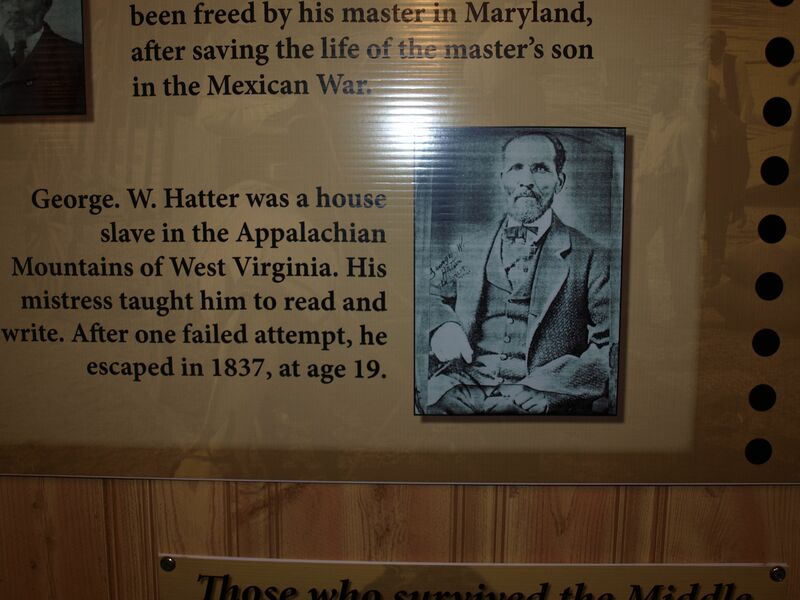 George Walter Hatter lived until almost 70, dying from injuries he suffered in a fall from the roof of his home 1888.